At bars in Italy, patrons can typically purchase coffee drinks, wine and liquor, soft drinks, as well as morning pastries and sandwiches called panini (un panino is one sandwich, two sandwiches are due panini). In larger bars, many flavors of Italy's famous gelato, or ice cream (really more ice milk) may be also be served. 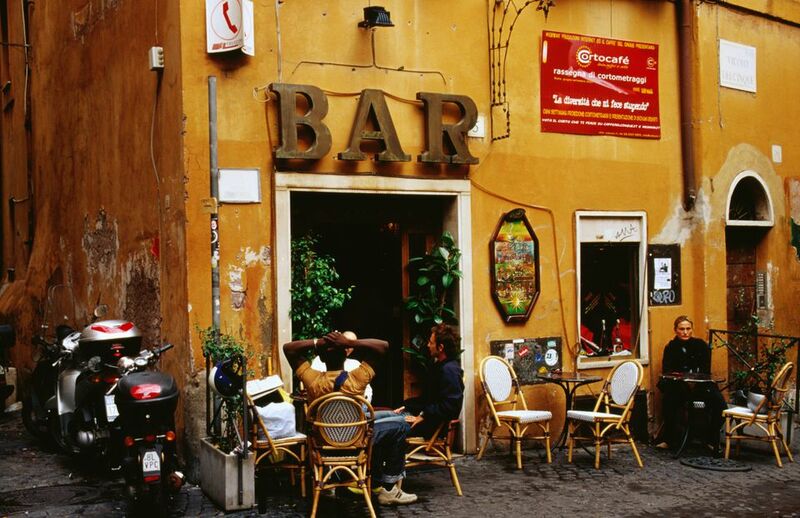 Italian bars are the center of social life in Italy but are not a place to consume large amounts of alcohol. People of all ages can go to the bar; there are no age restrictions—children are welcome and a common sight as people bring their families to their local watering hole. You may see groups of Italians playing cards, watching TV, or just gathering together to talk. Italians may visit their local bar several times in the morning for coffee and again in the early evening for an aperitivo or cocktail before dinner. The typical Italian breakfast is a cappuccino or espresso and cornetto often had in a bar. Stopping in for a coffee on the way to do an errand or when you're going somewhere with your friends is common in Italy. Beware that the coffee drink you order at home may be different from what you'll get in Italy. A "café" is often just a single espresso shot, whereas what most Americans think off as coffee is actually an Americano. At bars in larger cities, and especially ones near tourist centers, it will cost more to sit at a table, and often even more if the table is outside than it will be to stand at the bar because you will also pay for service. Prices are posted—al banco meaning the price for consuming a beverage at the bar or alla tavola meaning the price at the table. Smaller town bars often do not levy table charges. If you want to sit outside in a piazza to have a coffee, plan to spend some time enjoying the atmosphere. Once you've ordered something, you can stay as long as you want without having to order something else. Italian service isn't hurried or rushed, so be prepared to ask when you need your bill. If all you want is a quick drink, you're better off going inside where you'll pay less. Some bars or cafes in Italy are beautifully decorated and going inside is a pleasure. For example, Caffe Delle Carrozze in Chiavari has a beautifully carved marble bar. They have a fantastic house coffee, too. Additionally, the city of Turin was one of the first Italian cities to embrace cafe life and there are several historic coffee houses that are nice to visit.